Board index Facebook Fridays! - Free LMCCo Product Giveaways Every Week! 2013 Facebook Fridays! It's Friday, December 27, and time once again for our Facebook Fridays giveaway! 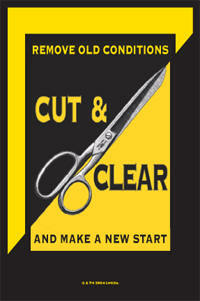 Today, in keeping with the spirit of the New Year, we're featuring a drawing of our Cut and Clear products. Put negativity and "stuck" conditions behind you and open yourself to a great new future. Today's random drawing will open the door to a New Year for 7 lucky winners. One very lucky winner will get a deluxe 11-item Cut and Clear Spell Kit with complete instructions for use (a $35.60 value!). Another fortunate soul will receive a fixed Cut and Clear Vigil Candle. 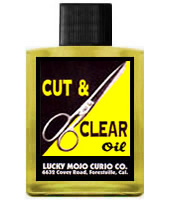 Two winners will each be given a bottle of our famous handmade Cut and Clear oil. 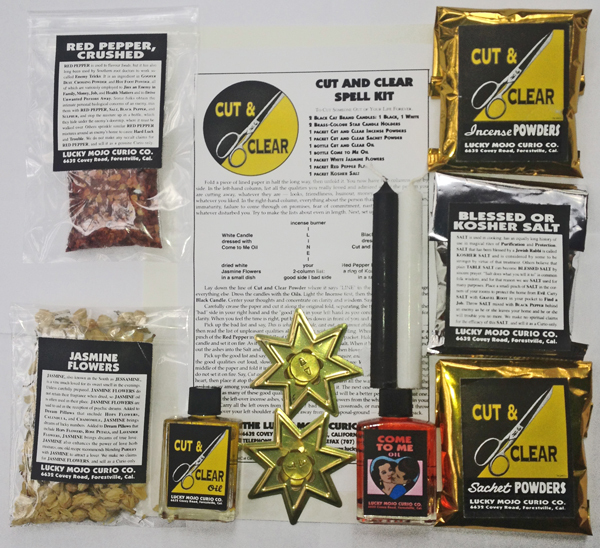 The remaining three winners will each receive a Cut and Clear foil-pack as we send out one each of our Cut and Clear Bath Crystals, Cut and Clear Incense Powders, and Cut and Clear Sachet Powders. At the end of the day, we will select [NUMBER winners at random, announce their names here, contact them via Facebook to get their mailing addresses, and send them their FREE BRAND products. Thanks for posting this to the Forum, Ernie. This drawing is being conducted at Facebook, and the top prize out of the 7 this week is a %35.60 value, so be sure to go on over and SIGN UP for a chance to win. Also remember to "like" the Facebook feed so that each week's new contest announcement will appear in your newsfeed. Congratulations, folks -- we will be contacting you by Facebook private message to get your mailing addresses for shipping purposes. NOTE: If you are not already a Facebook "friend" of ours, our message to you will appear in your "Other" message folder -- be sure to look for and open it. Thanks, all, for participating. Watch this space for a new giveaway next Friday!